The largest Servile War started (after First and Second uprising of slaves) simultaneously with a bitter class struggle, during the time of Quintus Sertorius and during the war between Romans and Mithridates. At the gladiator school Lentulus Batiatus in Capua, in 74 BC a conspiracy of slaves was made with the participation of about 200 people. The conspiracy was discovered, but 70 slaves managed to hide on the Vesuvius. 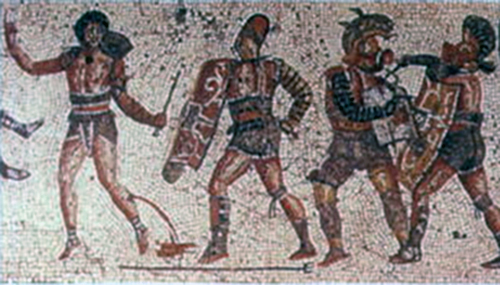 Gladiator Spartacus was at the head of the rebels. According to Plutarch, his origin was Thracian. He was mercenary in Roman troops, and after that he was captured and sold for gladiators. Later, because of his physical strength and courage he was freed and in school of Lentulus Batiatus he became a fencing master. According to Plutarch he was more like educated Helen than barbarian. Other leaders of the uprising were Crixus, Oenomaus and others. According to Appian, number of rebels started to grow on Vesuvius. 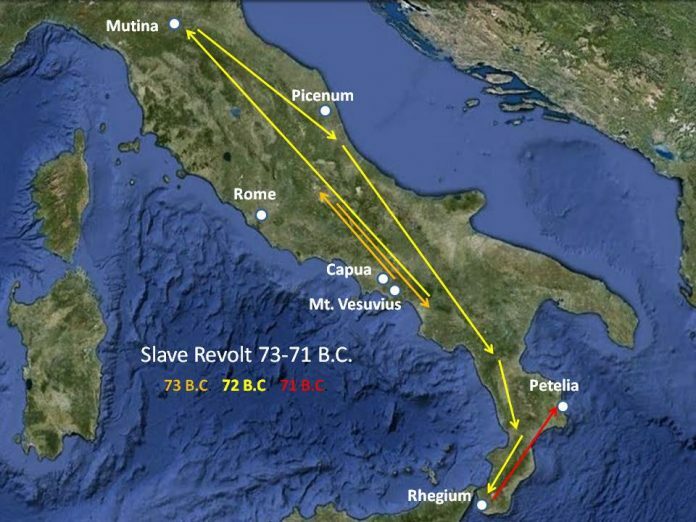 Slaves from neighboring properties and also freedmen came to Vesuvius. Against Spartacus were send only local roman troops which were defeated. Their weapons were seized by Spartacus. Gaius Claudius Glaber with a troop of 3.000 men occupied the only road that lead to Mount Vesuvius, but Spartacus ordered that they made ladder out of the wild vine branches. Spartacus men used this ladder to scale down the cliffs on the other side of the mountain and they outflanked Romans. This is the second Spartacus victory after, which the power of the rebels started to grow rapidly. In Campania was sent praetor Publius Varinius. Spartacus first conquered Varinius legate, and then personally Publius Varinius. After this the uprising was spread on to the areas nearby. Spartacus intended to bring slaves to the north of Italy, then to cross over Alps and to bring them home in Thrace and Gaul. Another leader of the rebellion Crixus wanted to lead them to Rome. The causes of disagreement were unclear, but it may be concluded that in Crixus army were Gauls and Germans, while, according to Plutarch, in Spartacus army were only the Thracians. Free peasants which became part of the movement were not interested to leave Italy. The result of the controversy was division of the Army rebels. In 72 BC, senate sent 2 consuls against slaves. One of consul, in Apulia, in the mountain of Garganus (Gargano), defeated Crixus troops and Crixus was killed. Spartacus, however, managed to give several defeats to Roman troops and after that he march to north of Italy. In Mutina (Modena), he defeated protector of Gaul Cisalpine. The road to the Alps was open, but Spartacus suddenly decided to turn back. It is possible that in the valley of river Po and in the Alpine areas Spartacus could not count on support. He decided to move to central Italy, and in Picenum he defeated both military Consuls. Now under the command of Spartacus was huge army. According to Eutropius, Spartacus had an army of 60.000 people, and according to Appian he had 120.000. Spartacus took all measures to increase discipline; he did not accept refugees, he prohibited the sale of gold and silver items. They only gather copper and iron for making of weapons. Spartacus with this army intended to go in to Rome in order to conquer it. Rome was in fear just like it was during Hannibal period. The Senate granted extraordinary measures to praetor Marcus Licinius Crassus (who once fought under the command of Sulla). He conducted decimation in the army, which had not been done for a long time in the army. In one entire cohort was carried out the execution of every 10th soldier. The execution was done before the eyes of the entire army and it was accompanied by dark rituals. Besides that, in the beginning, his battle was not successful and he even begged the Senate to ask Gnaeus Pompey from Spain to come and also Marcus Licinius Lucullus to come from Thrace. Spartacus decided to withdraw from the campaign towards the Rome. He was moving towards the south with his army, counting on the fact that he will move to Sicily and that he will have support of many slaves. Spartacus had a deal with Cilician pirates to transport his troops across the Straits of Messina, but they did not fulfil their promise. Transporting troops across the straits using rafts failed, and Lucullus decided to secure the coast of Sicily from Spartacus army. Due to this Spartacus was locked up in Bruttium and Crassus order that troops dug a deep trench across the straits from one sea to another. On one stormy winter night Spartacus ordered that a small portion of the trench would be cover with soil and dry branches. After troops did this, he decided to lead them across it. Crassus was afraid that Spartacus will go towards the Rome in order to conquer it, but Spartacus once again decided to withdraw from the plan to conquer Rome. Instead of that, he decided to move towards Brindisi (southern Italy). From this place he intended to go on to Greece. Gannicus and Castus also leaders of slaves refused to obey to Spartacus decision. Gannicus and Castus decided to leave Spartacus and go separate ways. Crassus decided to take advantage of the situation and he attacked already split squad and in a bloody battle he defeated them completely. Around 12.000 slaves died in this battle. Crassus wanted to end with a campaign before Pompey and Lucullus returned. Crassus decided immediately to attack Spartacus army. In 71 BC, in Apulia took place a decisive battle. Spartacus just before the battle started decided to kill his horse because he thought that in case of victory there will be a lot of good horses, and in the case of defeat he will not need not even his own. During the battle he killed many Roman soldiers including 2 centurion. Spartacus tried to force his way towards Crassus himself but he was killed at the battlefield. After Spartacus death, his army fell apart. Pompey arrived from Spain and together with Crassus he crucified around 6.000 people between Capua and Rome. Some troops of rebels stayed in Italy for entire decade.